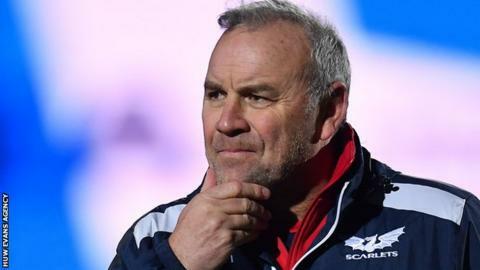 Wayne Pivac, the next Wales coach, says it is vital four competitive regions are maintained for the success of the national team. There is growing uncertainty for the Welsh domestic game with plans for change from the 2020-21 season. These include a possible north Wales region and reducing professional sides in south Wales from four to three. "For Wales, it's important that we keep our four regions, however that looks," said current Scarlets coach Pivac. The New Zealander takes over from Warren Gatland after the 2019 World Cup and wants to be able to pick from successful regional sides. "Four teams are important to get that number of players (the) exposure at this level, to bolster that national team," said Pivac. "You've got to have that strength in depth in the game, you've got to have the numbers, in the community game right through to the professional game." Wales currently has four professional regional teams - Cardiff Blues, Dragons, Ospreys and Scarlets - all based in south Wales. A possible merger between Ospreys and Cardiff Blues for next season was considered before Ospreys managing director Andrew Millward ruled that out last weekend and the status quo will remain for the 2020-21 campaign. Pivac refused to be drawn on the prospect of a merger. "It's not for me to consider," said Pivac, "It's not what I do, it's not my role. I coach the Scarlets. "Back home in New Zealand, there has always been a lot of history at all clubs and nobody wants to lose that. "It's happened before in other countries and it may happen here in the future, who knows? "I'm just pleased to say that the Scarlets are in reasonable shape off the field." Pivac says he has had assurances over the future of the Scarlets region. The proposed changes were intended to be introduced from next season but have been delayed until the 2020-21 season. It has meant difficult contract discussions for players coming to the end of their current deals in the summer of 2019, with regions unsure of the future structure. Pivac says coaches and players have become used to the uncertainty. "It's gone on for quite some time now," said Pivac. "All we can do is focus on the here and now and it's my last season with the Scarlets so all my time is devoted to getting the boys to perform the best we can. "It's taking a little bit of time to make these pretty important decisions and pretty frustrating in terms of finalising squads."